Home Mobile Android Score “Antutu” Xiaomi Gaming Phone Revealed, Compared Razer Phone? 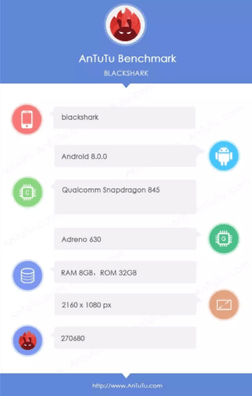 An image capture (screenshot) of AnTuTu benchmark application leaking a Xiaomi gaming mobile phone. The phone that uses the code name “Blackshark” it scored quite high at 270,680 points. The score is 100,000 points higher than Razer’s mobile phone, Razer Phone. Even higher than the performance of Galaxy S9 Plus which got its benchmark Antutu score leaked before the launch event, which amounted to 265,267 points. Not only that, this score is lined up as the highest synthetic benchmark score, as quoted from Phone Arena, Wednesday (21/2/2018). From Antutu benchmark leaks, the Xiaomi gaming phone is known to be powered by high-specification hardware suitable for gaming needs. Snapdragon 845 ( read : graphics phone snapdragon 845 kick iphone x )which is paired with Adreno 630 graphics card. The duo are both called improved graphics performance up to 32 percent compared to the Snapdragon 835 chipset. Blackshark will be equipped with 8 GB of RAM with 32 GB of storage media. The leak also mentions Android 8.0 Oreo will be used as a mobile operating system gaming. From the side of the screen, the Xiaomi gaming phone is estimated to use 18: 9 aspect ratio to support image quality of 2,160 x 1,080. Next articleComparing Google Maps with Waze, Which is Better?